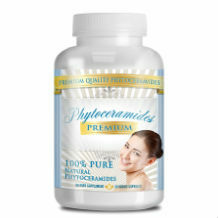 Rejuvenate Rice Phytoceramides is an anti aging supplement that is known to fight all the various signs of aging. It helps in promoting hydration while minimizing wrinkles and fine lines. The skin becomes more smooth and dryness goes away. It fights all these attributes of aging skin from the inside out. You will see results very fast, according to most consumers that have bought this product. The results are amazingly rewarding, since you achieve smooth radiant skin that is soft and wonderful to the touch. Smooth skin is not all one achieves when they start using Rejuvenate Rice Phytoceramides. As days go by and you continue taking it, the lines on your face start to fade away. Plumpness develops and elasticity starts to occur due to the new formation of collagen. You start to appear more youthful and in turn, start to fee it too. The chain reaction is inevitable. The manufacturer’s recommended dosage is one capsule per day taken with a meal. There are no stated side effects for the product Rejuvenate Rice Phytoceramides. They do not make a point of giving any kind of instructions about any warning signs or obstacles one might encounter while taking the drug. It is wise that you first consult your physician before you decide to go ahead and consume this drug. The valued price is at twenty four dollars and eighty five cents for a thirty day supply. The product can be found at Amazon. 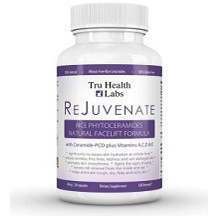 Tru Health Labs, manufacturers of Rejuvenate Rice Phytoceramides does not provide any guarantees for their product. There are no warranties, neither are there toll free numbers for customer support. Amazon, however, does have a number available, the site that the product is sold. there are also no product testimonials. When a manufacturer spends no time in establishing a clearly defined guarantee for their product, there should be cause for suspicion. All in all, The product Rejuvenate has ample benefits. It is probably a good Phytoceramides product, since it has all the ingredients that are necessary in eliminating fine lines and wrinkles. But it safe to say that this product is not backed up by its manufacturer in the form of a guarantee. When customers are satisfied with using a product and does what it says it does, then they will want to give their testimonials to other people who are seeking to look and feel younger. This product does not have reviews about it on the internet. FDA approved products carry more legitimacy. Rejuvenate Rice Phytoceramides has not been inspected by the FDA.